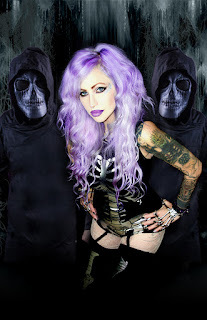 Hail Sagan Releases New Single and Video for "Doors Will Open"
Los Angeles, CA-based electronic rockers, Hail Sagan, have debuted their brand new music video for the single "Doors Will Open"?! Fronted by the mighty Sagan Amery, who's backed by some killer masked musicians including guitarist Nick Quijano (Powerman 5000), this act is one ALL heavy rock fans need to check out. "Doors Will Open", which you can now grab via CD Baby HERE or Amazon HERE, is set to be the featured track in the New Bugbear Entertainment video game Wreckfest that's due out in 2018 on Xbox, PS4 and PC. So, what are you waiting for? Pre-order the game HERE and watch the video which Sagan and Nick both directed and produced themselves right HERE. Commenting on their new video, the band noted: "The song is a heavier track compared to most of what we have released in the past; we feel it celebrates our roots as people who enjoy listening to a harder genre of music, while displaying our ability to be diverse musicians. After being involved in co-production of our last few videos, we were very interested in giving it a try ourselves, and seeing if we were able to apply what we had learned to the new music video for 'Doors Will Open.' Both of us are artists so we wanted to approach the visuals from a creative surreal perspective. We had a lot of fun designing the various sequences of the storyline, and we learned a lot about filming through trial and error. Overall, it was a great experience and we look forward to expanding our abilities in film and incorporating it with the music we release in the future." Be sure to check out the band live as they'll be embarking on a headlining tour in the U.S. in the New Year with Rivals and The Scars Heal in Time as support.